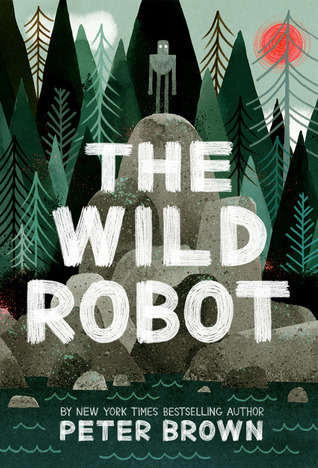 I’ll be honest… when I first saw the cover for The Wild Robot I just thought it was going to be another short picture book. Peter Brown’s other books have all been for younger readers, so it was a pretty safe assumption. So I was really surprised when it came in and turned out to be a short novel with some really cute illustrations. And then the writing and story grabbed my interest and made it one of the first truly unputdownable books I’ve read this year. Synopsis: When Roz wakes up alone on an island she isn’t sure how to survive in the wilderness, and all the animals either try to hurt her or run away. Unsure how to convince the animals around her that she is friendly, Roz sets out to learn the ways of the wild… with some interesting results. This book was so cute, and yet surprisingly mature. The truths of the natural world, including death, are not shied away from at all. I’m not entirely sure how some parents will feel about how blunt some of the scenes are, but I am impressed that the author didn’t try to create a fantasy world where everything is perfect forever. I think that children understand that some animals eat other animals, and that sometimes even very important people in our lives pass away. None of the scenes were graphic in any way, but I’m sure this book will provoke a lot of family discussions. I should warn anyone who can’t stand books that just end without resolution… this is literally one of the worst offenders for a cliffhanger ending I have ever come across in middle-grade fiction. I’m desperate to know what happens to the characters after this story ends. I really hope that a sequel is in the works because Peter Brown is going to leave a lot of people very unhappy otherwise. This sounds so good! My nephew has been on a Bambi kick lately, so it’s all animals and forests all the time. I agree with you that kids understand death and nature — if not, it’s nice to introduce it to them in a safe environment, like storytelling and be able to address their concerns so that they can develop that understanding and maybe even some coping mechanisms in a safe space. Thanks so much for sharing!